It’s the time of year where pink signs will start popping up around town! If you are like our bass singer Lara was a couple of years ago in forgetting about following up after seeing these signs while driving around town, here’s a close-up look! 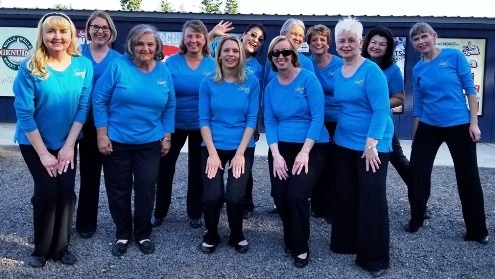 Blue Mountain Chorus is a women’s a cappella barbershop chorus, and the local representation of Sweet Adelines International. We welcome teen girls and women interested in learning how to sing, improving singing ability, learning about barbershop harmonies, and joining a supportive group to come check out a Monday night rehearsal! 6:30pm at Blue Mountain Community Church on Sturm Avenue. Hope to see you soon! 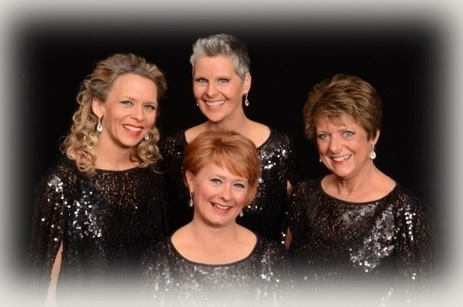 Our very own Blueprint quartet will be competing in Spokane at the North by Northwest Region 13 Sweet Adelines of Sweet Adelines International before noon today!! It will be a long and fun day of 33 quartets performing. Region 13 covers Alaska, Idaho, Montana, Oregon, and (of course!) Washington. To read more about Blueprint, click here. Have fun Vanessa, Ilona, Jenny, and Carey! We’re proud of you!! We welcome you to attend this women’s barbershop performance in our rehearsal space (the Fellowship Hall of Blue Mountain Community Church) and join us for refreshments afterwards. Come support our newest singers as we prepare to go to competition! 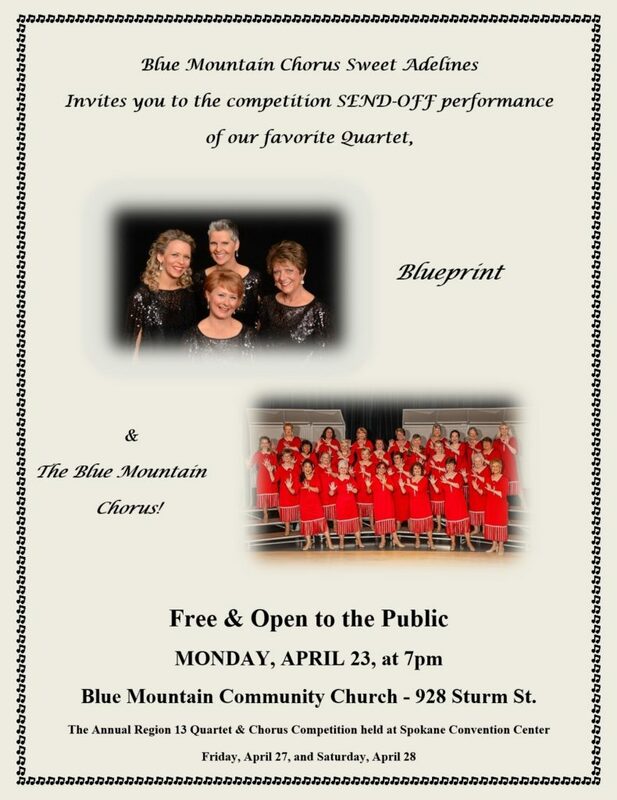 Attendees will experience 4-part a cappella women’s barbershop sung by the Blue Mountain Chorus and Blueprint quartet! Our directors will also share about how the judging works at the regional competition (which takes place the following weekend in Spokane). This send-off performance also gives our newest members practice at singing before an audience prior to competition. This is a great opportunity for female teenagers and adults interested in singing a cappella to attend and find out what we’re all about! The post dated July 4th talked about the fun we’ve been having performing at area events. This post talks about what’s happening with the chorus itself and our general plan for the rest of the year! 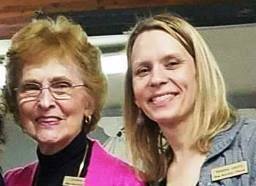 As of this year, the Blue Mountain Chorus meets for Monday night rehearsals (6:15pm) at the Blue Mountain Community Church and our beloved long-time director, Darlene Filla, welcomed Vanessa Leamy (tenor in Blueprint Quartet) as co-director. Click on the “Our Directors” tab under “About Us” to learn more about our talented leaders! We’ve said farewell to some members, welcomed new members, and actively seek more ladies interested in singing to come join us for a few rehearsals to get a feel for singing women’s barbershop. We will continue to raise funds through sales of items such as See’s Candies in order to help support some members to attend training events and the chorus to compete at next year’s regional competition. 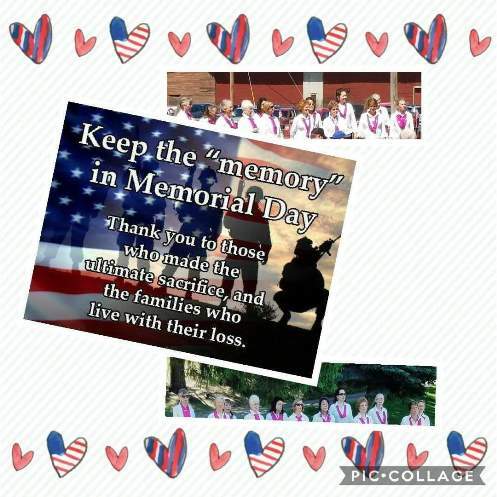 One of the biggest news items is we’ve decided to forego the fall annual show; instead, we are perfecting several “packages” (themes of music performance, such as: patriotic, country, Christmas) and increasing performances at community events. Many of you may have seen portions of the patriotic package options at area events mentioned in the July 4th post. 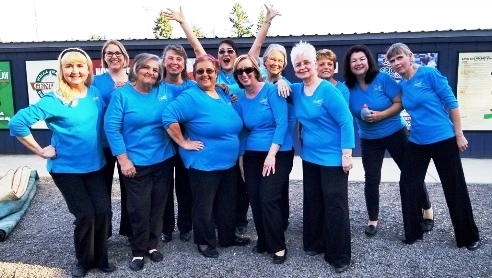 Members of the Blue Mountain Chorus will be performing at Wheatland Village on October 4th at 7pm. Our director, Darlene Filla, has been approached to schedule more local performances, details of which will be added to our “Upcoming Events” page as they are confirmed. 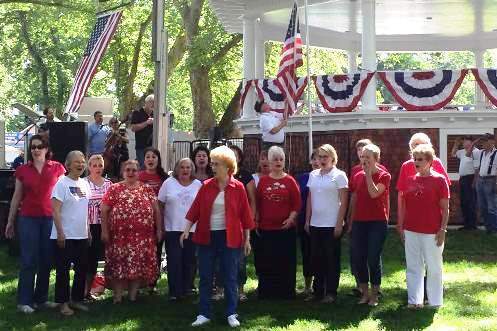 If you would like members of the Blue Mountain Chorus to sing at your event, please give us a call at 509-520-0675! BLUEPRINT Quartet, representing the Blue Mountain Chorus, also performs at area events. Contact Jenny at 509-525-9041 to find out more or to ask them to sing at your special event. You have the opportunity to see and hear Blueprint Quartet sing the national anthems at the Walla Walla Sweets Baseball game on Friday, August 4th, at 7pm! Finally, with Darlene’s enthusiastic spirit, we ask women of all ages (including teens! ), “do you LOVE TO SING?” as a sincere welcome to consider coming to a rehearsal to learn about barbershop music and even join us in singing on the risers! Please do come to experience singing with an encouraging and friendly group of women… you don’t need to know how to read music, you just need to enjoy singing! We hope to see you on a Monday night at the Blue Mountain Community Church! Having fun performing in the sun! Hi everyone! Many of the members of our Blue Mountain Chorus were able to participate in several community events around the area these last few months. If you happened to see/hear us perform and have pictures you want to share with us, let us know! At a Walla Walla Sweets ballgame! 4th of July at Pioneer Park! We opened with the “Star Spangled Banner,” followed by an “Ode to America,” and finished with a couple of singalongs. The last image is of Darlene leading a patriotic singalong of “God Bless America” and “Let There Be Peace on Earth“…what a lovely way to close our patriotic set of songs! After we performed, a lady approached to thank us for singing more than one song as her family came just to hear the Blue Mountain Chorus! She asked if we would be performing at other community events (so far Wheatland Village on Oct 4th at 7pm) and when we rehearse. The Blue Mountain Chorus is working on various “song packages” to take out into the community…so if you are wanting us to perform at an event, please give us a call! 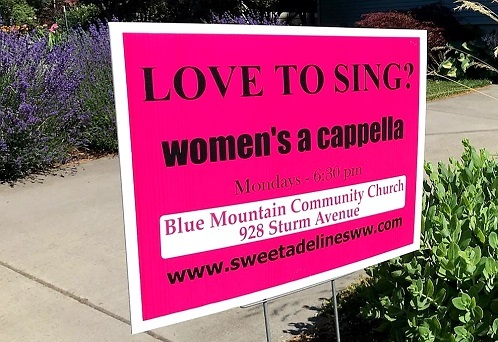 Finally, a reminder that we welcome teen girls and women to check out several of our rehearsals to experience how we learn and practice…and perhaps consider joining the Blue Mountain Chorus! We rehearse at 6:15pm on Monday nights at the Blue Mountain Community Church in Walla Walla. We hope to see you there!